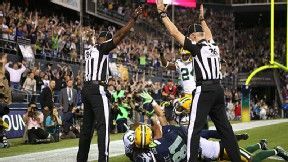 So a while ago I wrote a post on THE Canadian Personal Finance Blog about how everyone looks for scapegoats in their lives, and in specific I have seen many parents blame officials for game results, so I entitled the post I Blame the Refs. The post itself didn’t really spark too much rhetoric, or even many comments, so I filed that post in my archives and forgot about it. Fast forward to Tuesday morning this past week where the most horrificly badly NFL refereed game ever transpired, and on Tuesday I guess one of the most chosen searches in Bing was I Blame the Refs, because I surely got an 800% readership spike that day (no real increase in income, but a very large spike to show in my stats). When I first saw the spike, I wondered if I had been mentioned in the mainstream media again, however, thanks to Jetpack for WordPress the stats clearly showed that a lot of traffic came from Bing and it was for my referees post, which makes me laugh, but it’s never a bad thing either. I guess this is what they call “Long Tail” pick up, but I do have this happen every 4th of July with the What Does the 4th of July Mean to Me, post as well. I suppose sometimes it’s better to be lucky than good when it comes to Keyword searches.